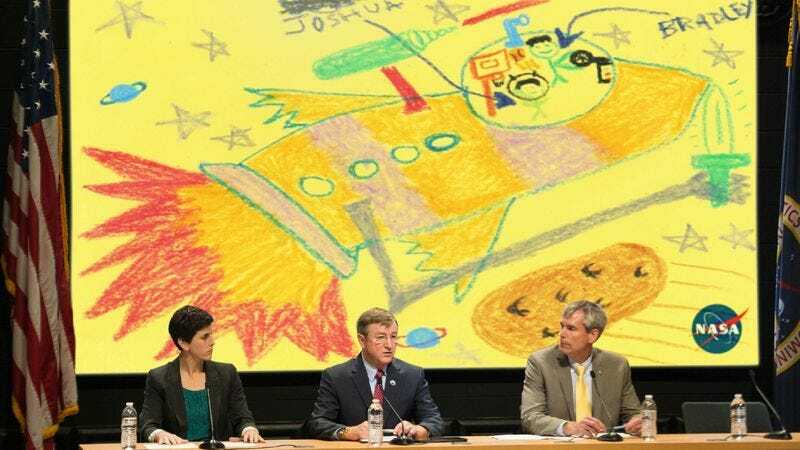 NASA scientists stress that the 6-year-old’s hand-drawn spacecraft would need a top-to-bottom redesign in order for it to be “even remotely close” to flight-ready. MONROEVILLE, PA—Listing off a litany of structural and technological flaws, the nation’s leading aerospace engineers issued a stern warning Thursday that local 6-year-old Bradley Koenig’s design for a spaceship is entirely unsafe. Experts from the fields of aerodynamics, jet propulsion, and control engineering unanimously confirmed that the orange-and-purple rocket ship, which Koenig drew during Mrs. Silvestri’s first-grade class, not only raises major safety concerns, but could compromise the lives of everyone on board were it to ever go to launch. Fletcher, who estimated that the spacecraft would cost in excess of $230 billion given the wide array of elaborate instruments affixed to the exterior, said that the vehicle’s protruding robot arm, which he noted with alarm was more than twice the length of the ship, certainly would not be deployed during takeoff and would not be holding a large sword, as depicted. Engineers also said that the ship’s apparent lack of oxygen generators, high-temperature insulation tiles, vertical stabilizers, doors of any kind, and an air pressurization system would significantly endanger the lives of the two smiling stick-figure crew members—distinctly labeled with blue arrows and large capital lettering as Koenig and his best friend, Joshua. “I would not even consider piloting such a craft without extensive safety modifications,” Ferguson added. Ferguson also said that the two variously sized wings mounted to either side of the spacecraft would compromise its flight trajectory, sending it careening dramatically off course during launch. He further explained that the cockpit’s steering wheel would be virtually useless in such a situation. “And, needless to say, navigating any manned ship so close to a giant speeding asteroid is also unbelievably dangerous,” Lozano added. Despite the clear and irrefutable problems in Koenig’s design, experts did admit that the ship’s giant laser cannon for shooting space monsters was the most awesome thing they had ever seen.